We tore out the upper cabinets along the window wall of our kitchen in favor of a dramatic vent hood and open shelving. 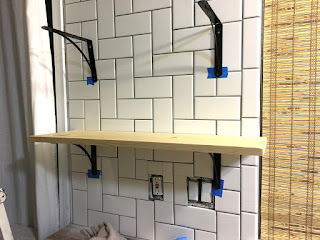 I like the look, the cabinets weren't that attractive (even if we had painted them like we did the rest), and they would let us show off our tile wall! 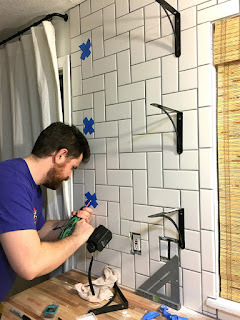 I did a little research on how to install shelves on a wall of tile (various results--you can put the hardware under the tile for floating shelves, even) but mostly just charged ahead with the plan and decided to figure it out later. So the time finally came the other week, and we had to buy brackets, shelving, and tools for installing into our tile wall! It ended up working out fabulously and I'm here to share our steps with you! 1. Cut the boards to length. We used a chop saw but had to cut one side, rotate 180 degrees, and very carefully line it up to cut the other side. We did need to sand the cut edges to even them out. 2. Oil the shelves the way you would a butcher block cutting board or counter. 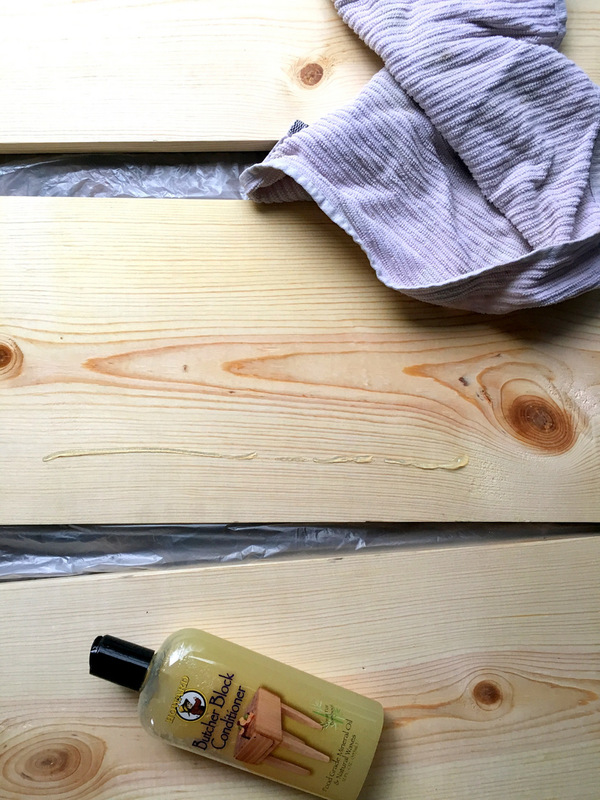 We wanted to go with a natural wood look so didn't want to stain the shelves, but the oil or conditioner keeps them from drying out and makes them easier to clean. 3. 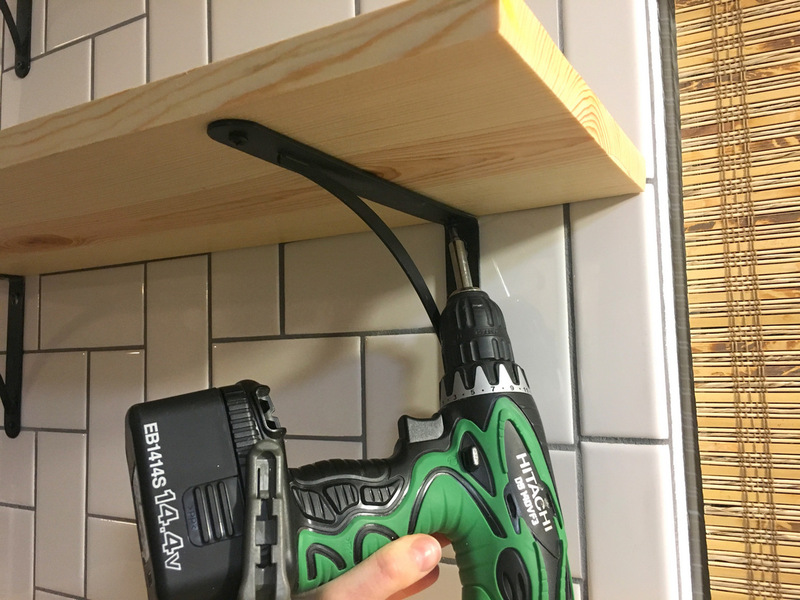 Measure bracket placement. 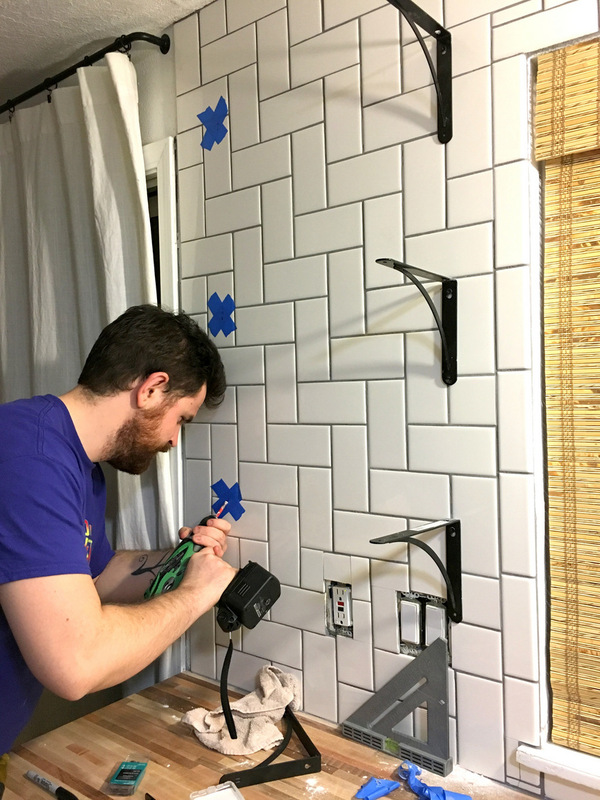 (NOTE: Before installing the tile we had measured and noted the stud location, so we knew we would drill into the studs with our brackets. 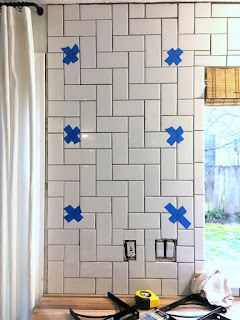 Mark locations, but cover with Xs of masking tape to protect the rest of the tile from cracking or scratches from the drill bit. 4. 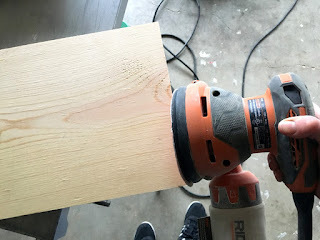 Drill top bracket holes on ONE side only. 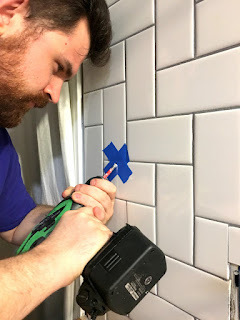 To drill through tile, start the diamond drill bit at an angle until you make an indentation. Then right the drill and drill straight through. We did three shelves; at this first step only drill the top bracket holes of all one side of the shelves. 5. 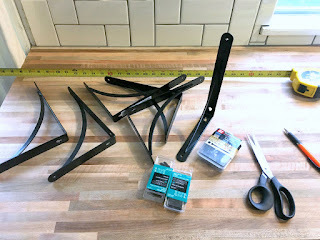 Dry fit shelves on all three brackets. 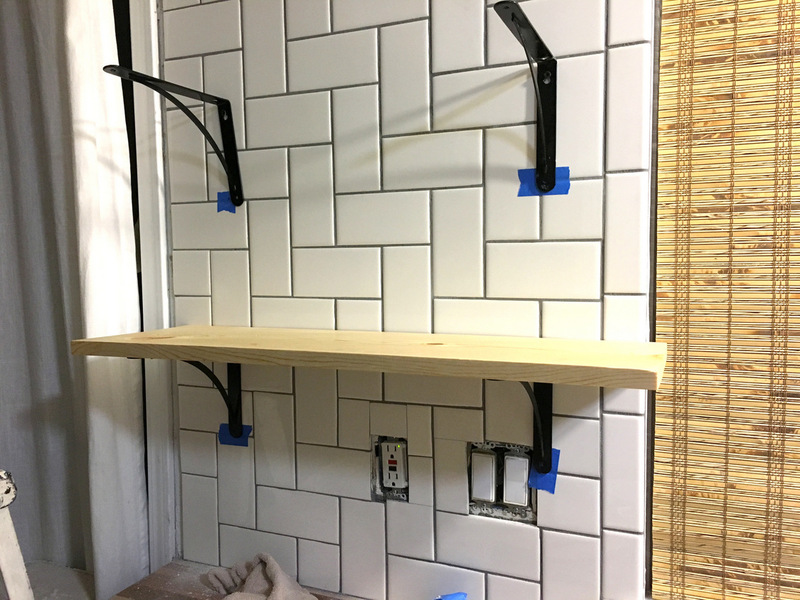 Put a shelf on each bracket, hold another bracket under the other side, and using a level, check placement of other side holes. We definitely adjusted them a little. 6. 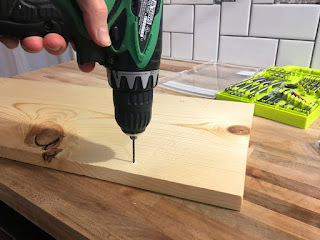 Drill other side top holes. 7. Mark bottom holes. 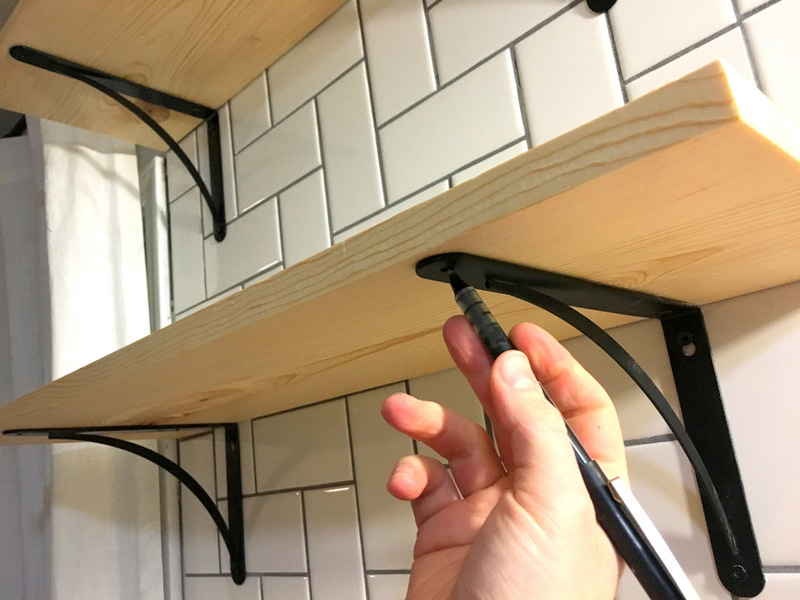 Put a shelf on each set of brackets and use a level on the top of the shelf and each bracket to make sure they're straight up and down. 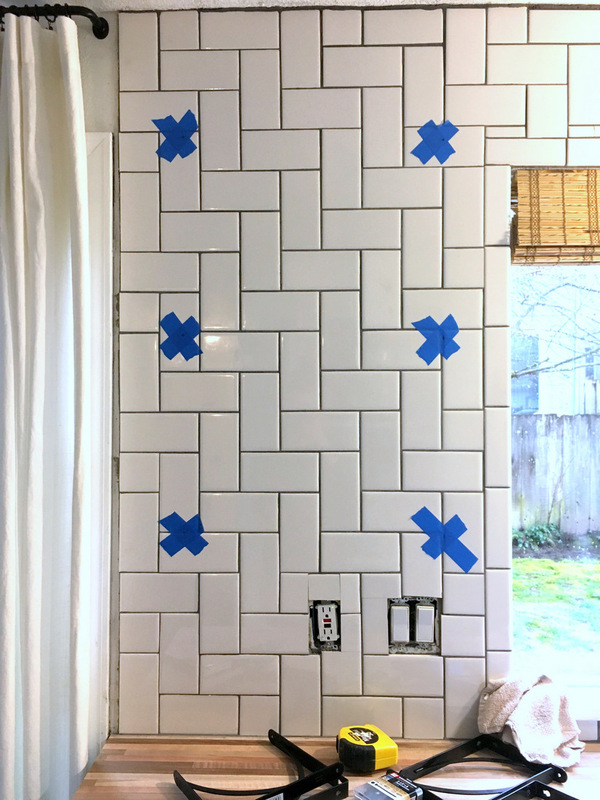 Put tape under each approximate bracket hole and mark on top of the tape. 9. Mark hole placement on shelves. They will all be slightly different, so keep the top, middle, and bottom shelves straight. 10. Carefully drill about 1/4" deep pilot holes into shelves on your marks. 11. 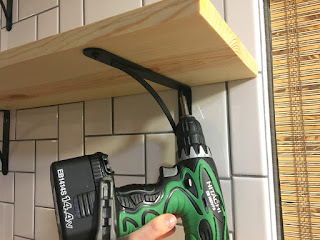 Screw in small screws to anchor shelves in place. That's it for the construction part! Now's the harder/artistic part--styling them!! 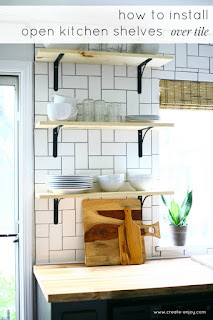 I think that will be an evolving process for us but for starters it is SO nice to have commonly used dishes right above the dishwasher (instead of on the counter on the opposite side of the kitchen where they were for months before we did the tiling and shelves). Hoorah!